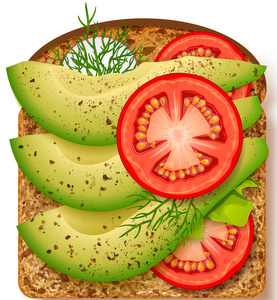 The partitive article refers to an unspecified quantity of food, liquid, or some other uncountable noun. English has no equivalent article – the partitive is usually translated by the adjectives "some" or "any," or may be left out entirely. Achète des épinards. Buy some spinach. J’ai mangé du pain hier. I ate bread yesterday. * As opposed to countable nouns like bars of chocolate, glasses of water, and euros. + There is only one plural partitive article: des. The partitive article is needed when talking about an unknown or unspecified quantity of something uncountable. J’ai acheté des pâtes. I bought some pasta. Water and pasta are both uncountable – you can’t ask "how many" water or pasta, only "how much." That’s how you know to use the partitive rather than the indefinite article. 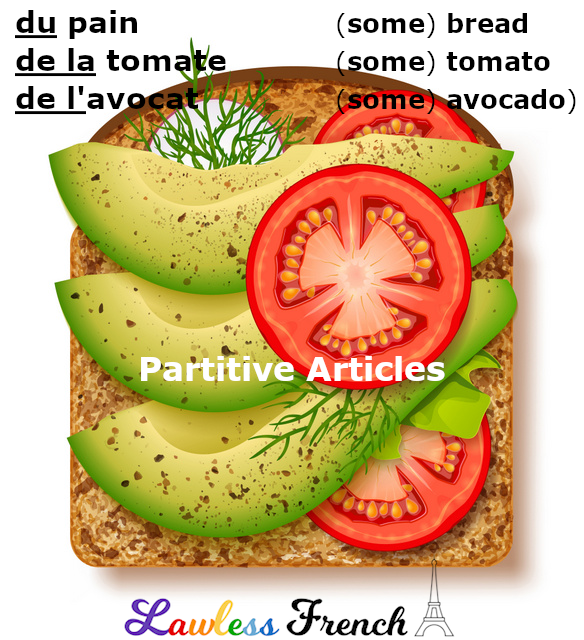 The partitive is used with abstract nouns after verbs like avoir and falloir. Tu as de la chance. You’re lucky. Il faut du courage. You need courage. The partitive is also used with faire and jouer plus musical instruments, and with faire for sports and other activities in the sense of practicing. Je fais / joue du violon. I play the violin. Il fait du droit. He practices law. In certain constructions, the partitive reverts to simply de (or its contraction d’). Je n’ai pas mangé de pain. I didn’t eat any bread. N’achète jamais d’épinards. Never buy spinach. J’ai bu beaucoup de café. I drank a lot of coffee. Il nous reste peu d’argent. We have little money left. J’ai envie de thé. I want some tea. As-tu besoin d’assistance ? Do you need help? Je cherche de beaux épinards. I’m looking for some beautiful spinach. Il fait de bons spaghettis. He makes good spaghetti. But: Je veux du bon fromage. I want some good cheese.